Designed to provide warmth while outdoors, this garment operates for up to 18 hours on a rechargeable battery. Ivers Yves Pierre has launched an Indiegogo campaign to support the product. There are many ways to stay warm when you’re outside during wintertime. Not too many of them are lightweight and fashionable. Ivers Yves Pierre, an entrepreneur from the Dominican Republic who now lives in Berlin, Germany, believes he has found the perfect solution. 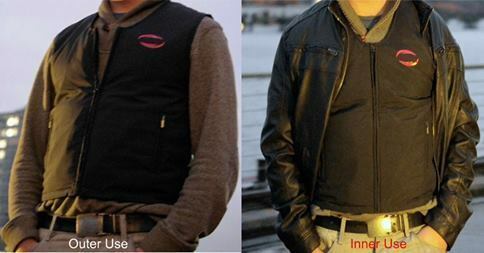 It’s a battery-powered heated vest that can be worn inside a jacket or on top of a shirt. The vest weighs just over a pound and the rechargeable battery lasts up to 18 hours. In addition, he made sure that this opensource wearable technology featured heating pads located in body locations that would optimize warmth. The final product is a durable, lightweight package that is contoured for a perfect fit and can help alleviate chronic pain, as well. Plus, the battery and control unit are detachable so the vest is machine washable. Copertura Label has received favorable reviews from dozens of television stations, as well as Yahoo! Finance, the Boston Business Journal, Buffalo Business First and other business periodicals. Pierre needs about $10,000 in start-up capital to bring this product to market. In order to generate this funding, he has launched an Indiegogo campaign, which can be viewed at http://www.indiegogo.com/projects/heated-vest-inner-and-outer-use-with-opensource. Donations of any amount are welcome. For a $99 contribution, backers will receive the vest and their names on the Copertura Label website (http://www.coperturalabel.com). That’s a 50 percent discount. Shipping ($8 to Germany, $22.50 elsewhere) is extra. Bulk discounts are available for retailers. For additional information, visit http://www.indiegogo.com/projects/heated-vest-inner-and-outer-use-with-opensource; the Copertura Label website, http://www.coperturalabel.com; or the Coptura Facebook page, http://www.facebook.com/coperturalabel. Pierre can be reached directly at ypierre(at)coperturalabel(dot)com.